Explore the diverse pasts that weave our multicultural nation together. Dive into the latest issue of our award-winning magazine. The ultimate resource for current or aspiring owners of historic homes. Or for folks who just like pretty pictures. Discover historic places across the nation and close to home. National Trust members receive discounts at more than 200 historic sites. Explore and discover historic places with these thematic guides. Together we can preserve America's National Treasures. Plan your visit to one, or all, of these incredible places. Make a vibrant future possible for our nation's most important places. Support preservation through advocacy and action. Discover the easy ways you can incorporate preservation into your everyday life—and support a terrific cause as you go. Wyvernwood, in Los Angeles' Boyle Heights neighborhood, opened in 1939 as housing for middle-income families. 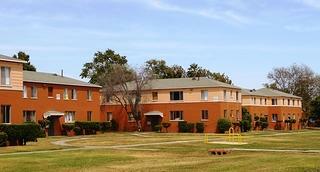 Wyvernwood Garden Apartments in Los Angeles’ Boyle Heights neighborhood were built with people in mind. There’s a large central green space where residents can congregate and kids can run around. Each of the 143 buildings is built around grassy garden areas, so that residents walk out their front door and into a park-like setting, rather than a busy street. The buildings, minimalist in design with low-pitched roofs, are positioned to let it plenty of sunlight and fresh air, while still giving each unit a sense of privacy. Opened in 1939 on nearly 70 acres, Wyvernwood was the first large-scale garden apartment built in Los Angeles. And like so many garden apartments in the city today, its future is threatened. But most of all, these garden apartments would emphasize community, through communal spaces and low-density layouts. Wyvernwood is a prime example of that. Throughout the years, the residents have really made it their own, Fine says, with the largely Latino community establishing new traditions and adding new layers of history to the 76-year-old site. Since 2007, the residents of Wyvernwood have been fighting its demolition. The complex’s owner, Miami-based Fifteen Group Land and Development LLC, has proposed to level Wyvernwood and replace it with a $2 billion development. That development would quadruple the site’s density and eliminate significant amounts of green space in the neighborhood. The residents and a coalition of local organizations, including the Los Angeles Conservancy, have been locked in an ongoing battle, holding protests, circulating petitions, and voicing their concerns to city officials. They’re fighting to save an important landmark—and their home. Los Angeles has one of the largest collections of garden apartments in the country, but they’re increasingly threatened with new development. The qualities that make them so appealing to renters—low density, lots of green space—also make them attractive to developers. To that end, the Los Angeles Conservancy launched its Los Angeles Garden Apartment Network in 2012 to provide resources for those who live in or own these types of multi-family complexes. Lauren Walser is the Los Angeles-based field editor of Preservation magazine. She enjoys writing and thinking about art, architecture, and public space, and hopes to one day restore her very own Arts and Crafts-style bungalow. Like this story? Then you’ll love our emails. Sign up today. The National Mall Tidal Basin is threatened by rising sea levels and as much as $500 million in repairs and upgrades. Join our campaign to ensure this 107-acre landscape is preserved for future generations. © 2019 National Trust for Historic Preservation. All Rights Reserved. The National Trust for Historic Preservation is a private 501(c)(3) nonprofit organization. The National Trust’s federal tax identification number is 53-0210807.